What is the mobile dashboard and what can I do with it? Home » What is the mobile dashboard and what can I do with it? Our dashboard is a PWA and combines customer management and messaging functions in one. All you have to do is to call it up via your smartphone via URL and log in with your access data. Of course, you can also add the mobile dashboard to your home screen so that it’s always at your fingertips. 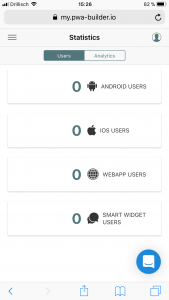 The mobile dashboard shows you all apps and customers as well as website visitors who use your progressive web app(s). This allows you to chat with customers and visitors of your website and to send them individual offers. 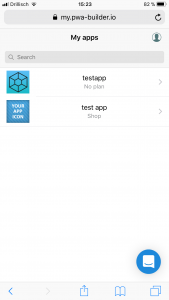 Simply access the dashboard from your mobile phone at my.pwa-builder.io and log in. You can also decide whether you want to log in with your Facebook or Google access data. You will find an overview of your pwa once you are in the mobile dashboard (Home). You can select an app from this list to view chat histories or users or visitors of your app. After you have selected an app, you can choose between Home, Users and Chats using the burger navigation bar (three bars in the top left-hand corner). All your users are listed under Users and existing chat histories are listed under Chats. If you click on a user under the Users view, you can either deactivate him (standby icon) or chat with him (balloon icon). You can quickly select a user and resume communication with him/her under Chats. You can log out of the mobile dashboard at any time by tapping the person icon > Logout in the upper right corner.